Feng shui is a 3000 year old Chinese philosophy based on the art of placement, balance, harmony and the cosmic energy of chi. So what does it have to do with getting a good night’s rest? Well, feng shui is all about helping energy flow, removing the negative and encouraging the positive. Most people know about it as a means to rearranging household furniture but like other Chinese practices, such as acupuncture, it has been gaining popularity in the Western World. Anyone who has had insomnia in their life will know how desperate you get when you can’t sleep. It is a terrible and debilitating thing, to get up each day feeling as tired if not more tired than you did the night before. This is exacerbated by knowing that the coming night probably brings little chance of a decent night’s sleep. People become so desperate that they will try things that they normally wouldn’t, like using feng shui to help them get a decent night’s sleep. Your bedroom is critical to how you sleep. Having an environment that is not conducive to sleeping will negatively impact on your sleep. It is as simple as that. Conversely, having a space that is ideal for sleeping will help you to get to sleep and will improve the quality of that sleep. Your bedroom needs to be a tranquil and peaceful place, one that helps lull you to sleep. 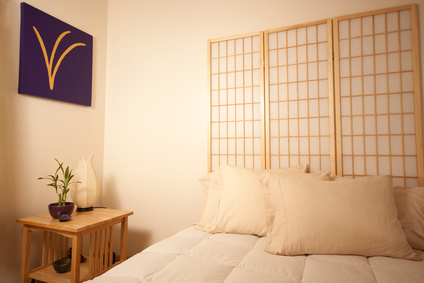 Feng shui can help make your bedroom into the sleep haven you need. Here are a few helpful pointers. First, bed placement is key. Do not have your bed in line with the door, this is called the death position in feng shui and it causes your chi to flow out the door. Try to place your bed where you can get a good view out your windows, put it against a solid wall. Don’t place it under a window and do not having it under any exposed beams as this is thought to dilute your chi. It is best to have your bed approachable from both sides as this is good for retaining your chi. Clutter and electronic equipment can cause chi to stagnate and erode so clean your room and cover up any electrical devices you do have with a blanket or sheet if you cannot take them out all together. Having peaceful and relaxing art on your walls is also good for your chi. Colours that encourage chi are the skin colours, white and brown, cream and yellow so find art with these colours. The ancient Chinese philosophy of feng shui could help you sleep better, and if not you’ll at least have a clean bedroom! Never place your bed in line with the door. Put it where you can see out the window but not under the window or exposed beams. Keep your room clean and remove or cover all electronics. Have peaceful art in skin tone colours on your wall. If you are struggling to sleep, the Chinese philosophy of feng shui could help, as it focuses on how the placement of objects in a space can affect the occupants and therefore can help shape your bedroom into a good sleeping space.